When you’ve got a lot of music, you generally have no problem fitting it on your Mac, but you may run into problems syncing your iPod or iPhone. Depending on which model you own, you may not be able to put all your music on your portable device. There was a time when Apple sold an iPod classic that held 160GB of music, but the last refresh of the product line eliminated that version. The iPod classic is now available in the one-size-fits-all 120GB model only. Music lovers with large libraries, who had been hoping for a larger capacity iPod, are holding on to their 160GB classics and taking good care of them. If you have more music than your iPod holds—regardless of its size—then you need to adopt a strategy to choose what you want to take with you on the go. The first method is simple, yet requires a fair amount of work if you have a lot of music. When you connect your iPod, the Summary screen in iTunes offers the option to Sync Only Checked Music and Videos. This means that any items that are unchecked won’t be copied. I use this for my 160GB iPod (my library is currently around 240GB); however, it requires that I check or uncheck music when I want to add or remove music on the iPod. Unchecking a track is easy: you just click the checkbox to the left of it. If you want to uncheck multiple tracks, you can press the Command key and click; this will uncheck (or check) all visible tracks. You wouldn’t want to do this when your entire library is selected, but when you’ve selected, for example, a single album or playlist. You can also select any number of tracks then Control-click or right-click and choose Check Selection or Uncheck Selection from the contextual menu. If you work like this, you never need to worry about syncing your iPod. Once you’ve unchecked enough tracks the remainder will fit on your device. However, you need to constantly check and uncheck tracks as you add music or change what you want to listen to. Another method is to only copy selected playlists. Even if you never listen to your music in playlists, you can use them for organizing it. If you click the Music tab of iTunes’ settings when your iPod is connected, you can choose to sync only selected playlists. Check the playlists you want to sync and you’re ready. Of course, you need to create those playlists if you don’t already have some. I have a single playlist for my iPod nano where I add or remove albums or songs I want to hear. But you can use as many playlists as you want, depending on your mood or what music you may have recently added and want to hear. Check the playlists you want copied to your iPod, and you won’t have to worry about checking or unchecking specific tracks. Another trick—if you simply want a selection of your music and don’t care what gets copied—is to create a smart playlist with the condition Kind Contains Audio, and limit it to a certain size, with songs selected at random. It’s best to limit it to one gigabyte less than the capacity of your iPod so you can fit all your music. However, if you want to put podcasts or videos on your iPod, you should make it smaller. Regarding podcasts and videos, iTunes lets you choose which to copy, in a manner similar to the playlist selection. You can choose from a number of options, such as copying specific podcasts or TV shows, or unlistened or unwatched episodes, or all or nothing. You can also select individual movies to copy. If you want total control over your iPod, however, there’s a more radical way. Within the Summary tab, check the Manually Manage Music and Videos option. If you do this, you just drag songs, albums, videos, or playlists onto your iPod’s icon in iTunes’ Source list to copy them. Podcasts still use the settings in the Podcasts tab, however, so you can choose to copy only, say, unlistened episodes. 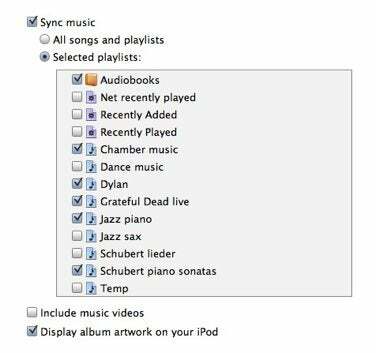 To remove something from a manually-synced iPod, just select the iPod in iTunes’ Source list, flip down the triangle next to it to scour its contents, find the item you want to delete, select it, and press your keyboard’s Delete key to delete the item. The disadvantage to this strategy is that iTunes doesn’t copy play counts and last played dates from the iPod. What about you? How do you whittle down your music library to the size of your iPod?